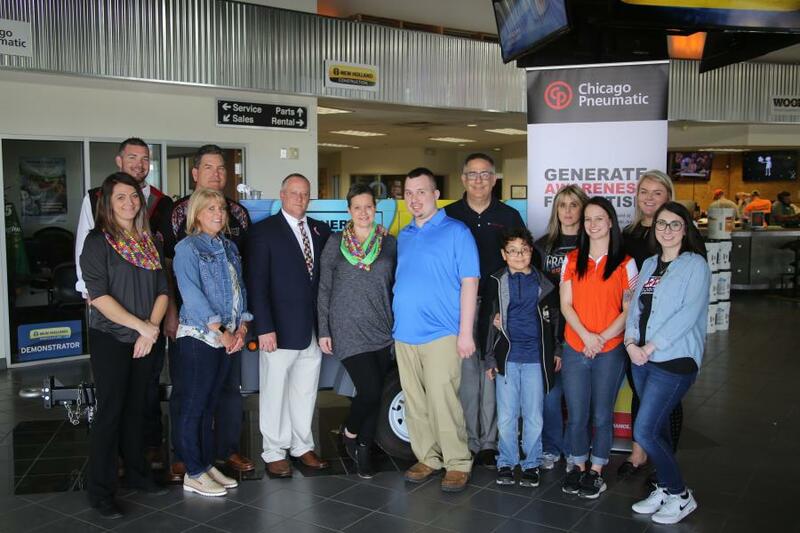 In late April, Franklin Equipment hosted a check presentation ceremony at its location in Groveport, Ohio. The money raised comes directly from the sale of 13 CPG 25 units over the course of The Rental Show. Franklin Equipment also threw in an additional $500 to the cause. Every 11 minutes someone in the United States is diagnosed with autism. Autism is a complex development disability affecting a person's ability to communicate and interact with others. Signs typically appear during early childhood. The costs of caring for just one individual with autism can be as high as $2.4 million, including support needs for everything from medical treatments to costs related to school and employment. 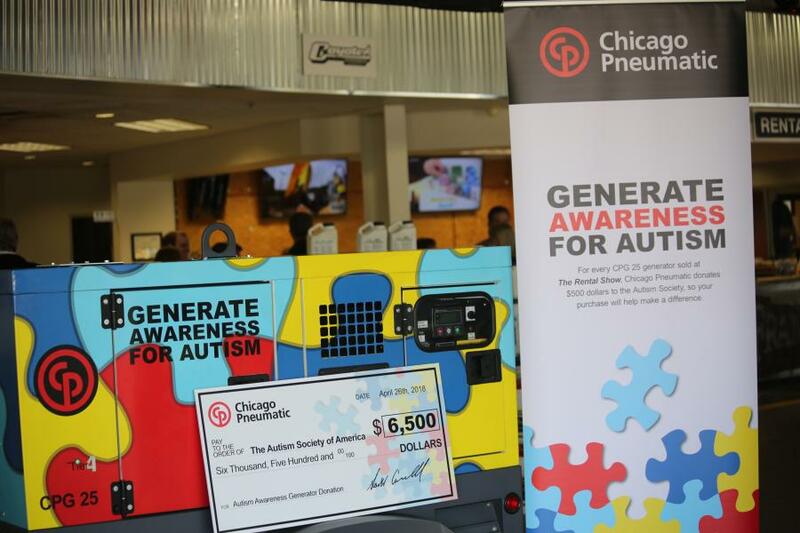 The Chicago Pneumatic Power Technique (CP) team wants to raise awareness of autism and support it. The cause took center stage this year at The Rental Show, championed by Midwest regional sales manager Rob Teasley, whose son is autistic. When CP put together their autism campaign, they wanted to go big. The team went to the drawing board with ideas. The result: a CPG generator wrapped with the iconic puzzle pieces of the Autism Society of America, to be sold at The Rental Show. They also determined that for every CPG generator sold at the show, CP would donate $500. The puzzle pieces reflect the complexity of the autism spectrum, while different colors and shapes represent the diversity of people and families living with the condition. In addition to branding the generator, the CP team also wore puzzle piece ties and scarves, while handing out “I Love Someone with Autism” bracelets to customers. The CPG 25 generator was positioned in the center of the CP booth at the American Rental Association's 62nd annual show. As soon as the show floor opened, a few Franklin Equipment team members walked directly to the CP booth, purchasing the model from Teasley. This cause is near to the hearts of their dealership as they too have colleagues affected by autism. They plan to continue to spread awareness for as long as they rent the unit out to customers. Since The Rental Show, the effort has now been doubled. An additional model will receive the same autism branded treatment for A Tool Shed. Located in Sunnyvale, Calif., the dealer also plans to rent out the unit with proceeds going to an autism charity. In late April, Franklin Equipment hosted a check presentation ceremony at its location in Groveport, Ohio. With the CPG 25 generator behind them, Teasley, with wife Tiffany and son Austin, spoke about what it personally meant for CP to get involved with the Autism Society. Teasley then handed over a check for $6,500 to Scott Badesch, president of the Autism Society of America. The money raised comes directly from the sale of 13 CPG 25 units over the course of The Rental Show. Franklin Equipment also threw in an additional $500 to the cause. According to the Autism Society, autism is treatable. Children may not be able to outgrow it, but studies show early diagnosis and intervention leads to much improved outcomes. The brightness of the puzzle pieces signals hope — hope that increased awareness of autism, early intervention and access to appropriate services and support, will allow people living with autism to lead full lives, able to interact with the world on their own terms. You won't see the charitable initiative stopping here. CP plans to highlight a different sales manager each year and the charity of their choice. The team is looking forward to generating some good by promoting one charitable effort at a time. Rob Teasley and wife Tiffany live in LaPorte, Ind., with son Austin, 23, who is autistic. Austin's overall welfare depends on the direction and attention his parents provide for him 24/7. Austin struggles with the effects of autism everyday, however, he has made progress and has a job. Routine is critical in his life and his parents have created an environment for him to thrive in. They continue to prepare each meal and take turns driving him to work. “It is a different life and one that not only has given my wife and I a different perspective, but has taught us patience along the way,” Teasley added.